The anet a8 is powered from the mains. The supplied kit has a mains lead which is connecte d to the anet a8 power supply directly. To switch on and off the printer involves pulling the plug. If the printer starts going wrong and you need to stop it quickly, then pulling the plug may be the only option – can you reach yours quickly? If not there is a mod you can do easily to add a mains switch and socket. 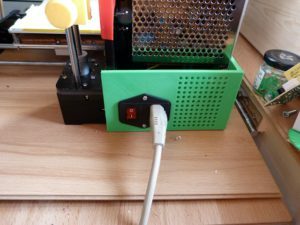 This mod makes it easy to move the printer around, with out the cable trailing and allows the printer to be switched on and off when stood in front of it.